Four Salt Lake Community College students proved that an outstanding ePortfolio can pay dividends earlier this week at the 6th Annual ePortfolio Showcase. 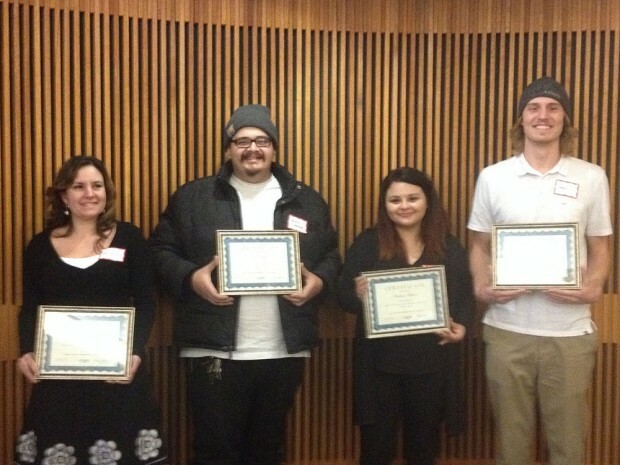 The showcase celebrated SLCC students who went above and beyond in their learning. Each student received a framed certificate of recognition and a full tuition waiver for spring semester. Creating a strong ePortfolio also allowed these award-winning students to reflect on their hard work in a more meaningful way. While student sentiments range from ambivalence to outright disdain for this general education requirement, ePortfolios act as an archive of academic achievement and a way to measure one’s progress. Professors will often look at a student’s ePortfolio when considering a letter of recommendation, and in some cases, a detailed ePortfolio can set a resume apart for potential employers. It’s a work of self-reflection that becomes more robust with each new experience. Managing an ePortfolio is an intensely reflective process which helps develop self-awareness. Students can also share what they do outside the classroom, as some of those activities are not fully realized until filtered through the prism of academia. Because of the ePortfolio, these students walk away with free tuition for a semester and a tangible representation of how far they have come.